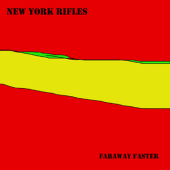 On their debut full-length, Faraway Faster, New York Rifles, fronted by Portland-based rocker Scott Young, deliver a pop-punk-infused, sugary rock record that, without closer inspection, resembles The B-52s and X. Purely because back-up vocalist Susan "Kitty" Norton compliments Young in a way that will bring those two bands to most people's minds. But, upon closer inspection, people will discover much more than those comparisons. Young writes songs that, though pop songs at the core, roar with the intensity of mid-90s guitar rock. As is evident by album opener, "Tangerine Nails", pop is an important element for Young. But, it isn't everything, and his post-punk rock leanings seep through in the guitar-soaked noise that blazes through the chorus of this song while Young screams "You and your jet black hair", explaining what he finds so irresistible in a lady that has caught his fancy. "Trouble Boy" is one of the band's punk numbers. And though Norton and Young's voices together remind you of X, The Ramones, or even Nirvana, should also come to mind in this intense, full-throttle song. "Thumb Tack" is light and loose, but burns with a rock appetite, making it a song that would have not been out of place, but would have fit in quite nicely, during the Northwest's post-punk explosion in the early and mid 90s. "Redlight Suppertime" is classic CBGB's rock in full effect, while "All He Ever Wanted" is quirky rock that even snobby indie-rockers will openly embrace. New York Rifles can be called a lot of things: pop-punk, punk, post-grunge pop, etc. But, really, this is just good pop and rock colliding together in a shining explosion that will remind you why a pop song is so important in life. Especially when it's noisy. I'll give it a B+. New York Dolls: A Hard Night's Day New York Ska-Jazz Ensemble: Get This!